I've posted before that both Skynet's existence, as well as Connor's, are dependent on each other. 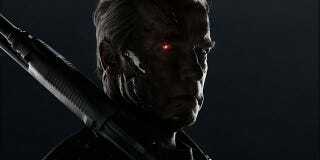 No John Connor, no Terminator, no reverse-engineered Skynet. No Terminator, no Kyle Reese time-travel bom-chicka-wow, no bootstraps-baby John Connor. I've always thought it would be an interesting direction to take the franchise if Connor had some insidious motive to ensure his own existence, so he had some sort of truce with Skynet that ensured they'd perpetually be at war. Adult Connor would always make sure Skynet would have a way to come into existence, and Skynet would always ensure there was a reason for Kyle Reese to be sent back to father John. If one wasn't so inclined to make John so sinister and, well, evil, one could bring to the forefront the "chess match" nature of the relationship between John and Skynet. The struggle could be more about one-upping each other, while still allowing for the entangled interdependence on each other for existence. This way would allow for a "hero moment" for John, when he decides his life is worth the sacrifice to ensure the survival of the human race and the actual removal of Skynet from existence. Potential spoilers from here down. But I think the idea of John being possessed by nanobots is demeaning and insulting to the franchise. It's gross, offensive, an affront, any other synonym that fits there. I think it assumes audiences wouldn't be sophisticated enough to understand a more complex motive for Connor to be in league with Skynet, beyond "Hurr Durr Mind Control!" It makes me miss the implications when Derek realizes that it isn't his Jessie sitting in the car with him.